Manuka Honey There are 2 products. It belongs to range of 100% natural products coming from clean and ecological New Zealand farms. Honey has gained its popularity all over the world in terms of its valuable health properties. The main active ingredient of manuka honey is methylglyoxal (MGO). The higher MGO concentration, the stronger the effect of honey. Due to its unique composition it supplies the body with a number of healthy components. Irreplaceable for sore throats. In addition manuka honey is widely used in cosmetics. It supports the treatment of skin lesions such as: acne, psoriasis and atopic dermatitis. 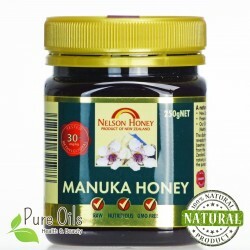 Manuka honey, Nelson Honey- produced from the nectar of flowers green manuka bush occurring in New Zealand. Manuka honey is characterized by a high content of methylglyoxal (MGO), which has the following properties: antibacterial, antifungal, antiviral, inflammatory, antioxidant, antiseptic. 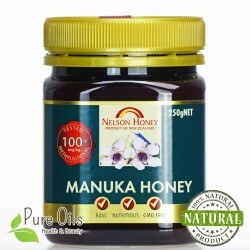 Manuka Nelson Honey 100+ is obtained from the nectar of flowers green manuka bush occurring in New Zealand. Manuka honey is characterized by a high content of methylglyoxal (MGO), which has the following properties: antiseptic, antiphlogistic, antibacterial, antioxidant, antiviral, antifungal.